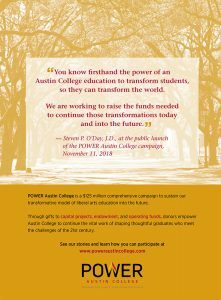 2018, my first full year at Austin College, was one to remember—a year of listening and learning, a year of asking “What’s Next?” and a year of taking action. Iconic image from one year along Grand Avenue and the moments that define Austin College. 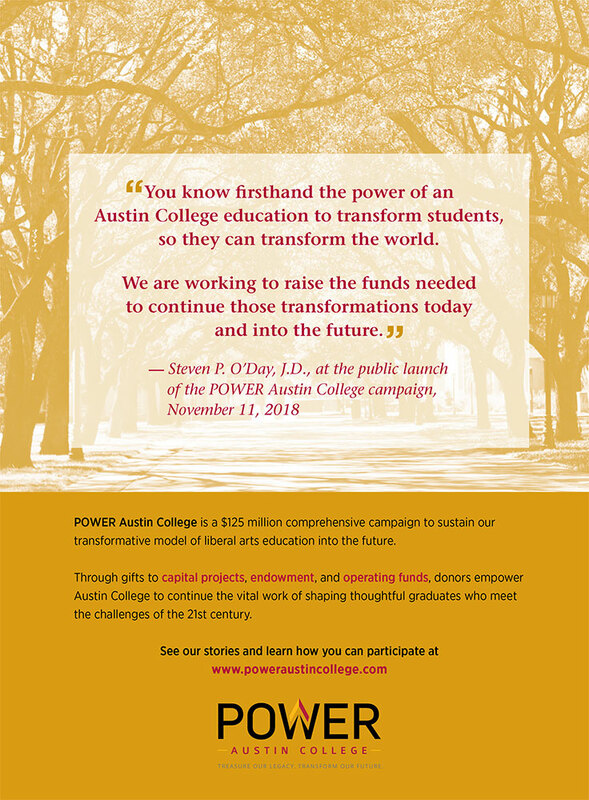 Through the changing seasons of Austin College’s history, a values-based mission and a foundation in the liberal arts have combined to deliver educational experiences that transform the lives of students. With the work of his hands, Erich Thompson ’78 crafts hope and faith into form. As he designs and creates chancel furniture for sanctuaries and worship centers, he aims to capture the mindset and mission of each congregation. Hannah Natatorium was steamy, crowded, and energized when the 2018 ’Roo men’s water polo team hosted the Brown University Bears last September. Though water polo and its rules were new to many of the fans that day, they understood this was a historic moment. In summer 2017, Deepa Shridhar ’09 set the parking brake for her Puli-Ra food truck in Manchaca, Texas. Serving Indian food with a Southern spin and enjoying cool cider in the heart of Texas are the things of Deepa’s dreams. 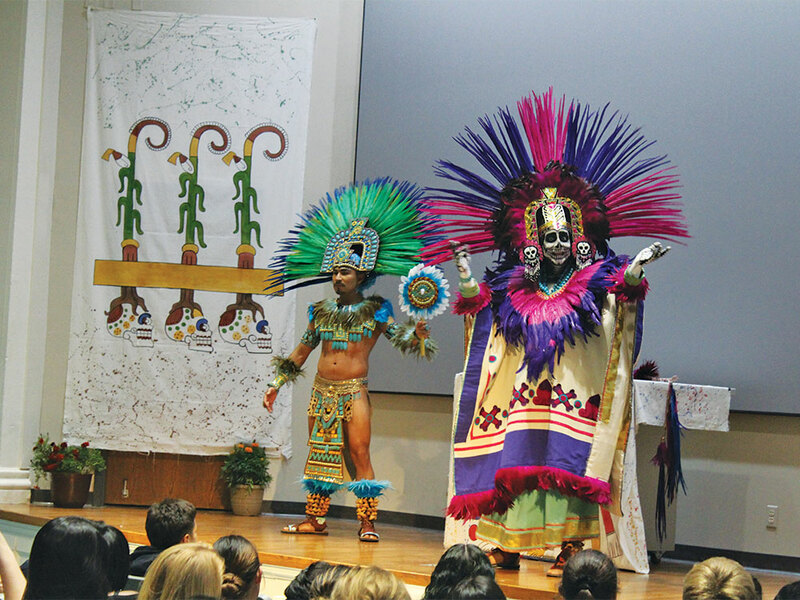 Artists and actors Román Iván Gómez and Erik De Luna brought Día de Muertos alive at Austin College with brilliant colors and vibrant dance. The event was hosted by the Center for Southwestern & Mexican Studies. Days start at 4 a.m. with a 1-mile walk to the jobsite. The work itself is hot and dirty, sometimes in cramped and confining spaces that leave workers bruised and bleeding by day’s end. Frequently being the “new kid” due to the moves of his military family, young Michael Johnston ’02 found his own entertainment—and a lifelong passion—in art. In a 2018 JanTerm course taught by Mark Monroe ’81 of the Art faculty, students and staff member Heidi Rushing ’04 transformed two cars into street-legal—and award-winning—works of art. I invite you to take a moment and think about educators who inspired and animated your life. 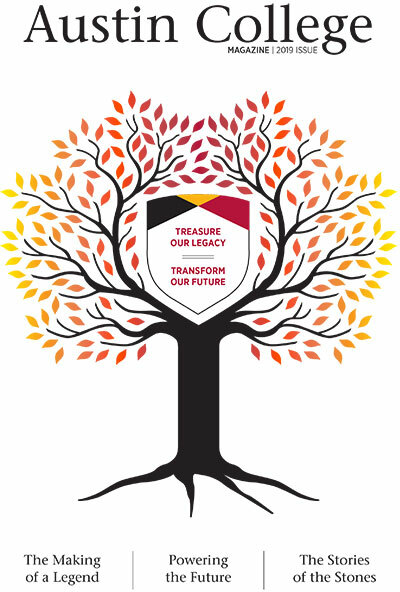 Each of us has had a teacher, mentor, or coach who stands out in our hearts and memories as a significant influence in the trajectory of our lives.